What could be better than chicken and bacon? Make a bold statement with Old El Paso’s™ Stand ‘N Stuff™ BOLD Nacho Cheese Taco Kit, and top it off with a spicy corn salsa! Heat olive oil in frying pan over medium heat. Add onion and zucchini and cook until onion is softened. Add chicken and continue to cook, stirring with a wooden spoon to break up lumps. Add the Taco Spice Mix and stir for 1 minute. Add ¾ cup water and simmer for 2 minutes, or until sauce thickens. In a Saucepan, bring water to boil and add the corn. Cook corn for 2 minutes or until tender. Remove from heat and allow to cool. Use a sharp knife to remove kernels from cob. Heat a frying pan over medium heat and cook bacon until crispy. Remove and place aside on a paper towel. For Bacon and Corn Salsa, combine corn, avocado, lime juice and top with crumbled bacon. For Crunchy Taco Shells follow on pack instructions. 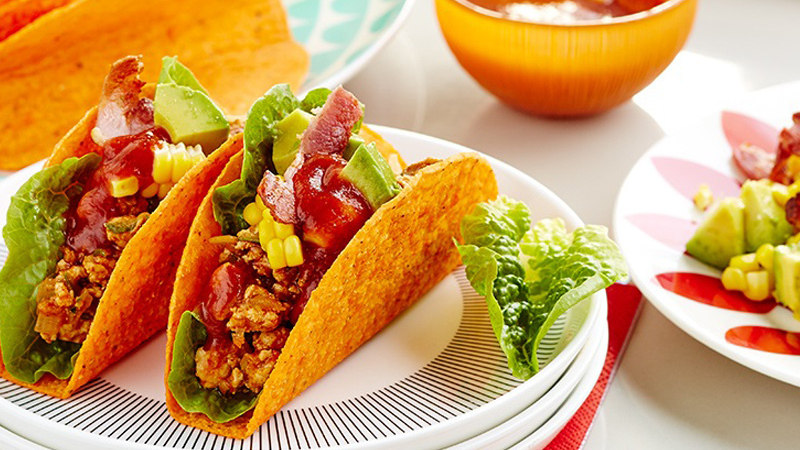 Build your own BOLD Tacos with lettuce, chicken, corn and bacon salsa and Mild Taco Sauce.